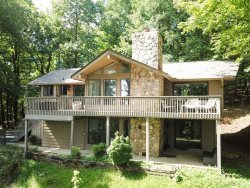 Lake Place rental sleeps up to 8 persons, making it a great choice for your family and friends. This 2,800 square foot luxury home has year round mountain views and is close to hiking, swimming, fishing, golf, tennis, racquetball, a fitness center, grocery store and playground. King master bedroom on the main floor with walk in shower, Queen bedroom upstairs with bathroom in loft area, Queen bedroom on terrace and (2) Twin bedroom with a Jack n Jill tub/shower bath between them.